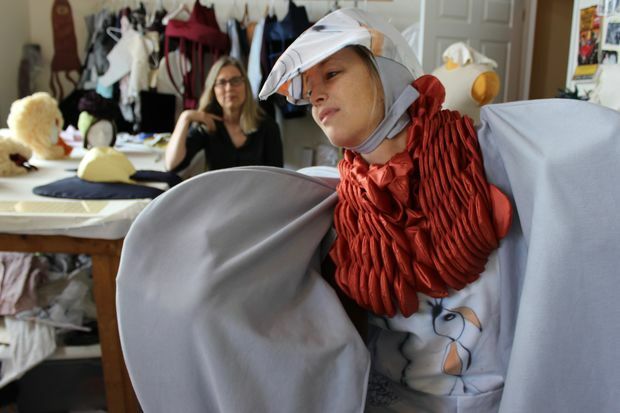 Beverly artist Sandra Leonard (back) has created 15 wild costumes that will be showcased Saturday night as part of her "Wandering Bird" show at the Beverly Arts Center. Choreographer Sanda Kaufmann (front) is among the four professional dancers and seven models that will wear Leonard's "sculptures." MORGAN PARK — Halloween may be over, but there's one more costume party happening at the Beverly Arts Center. Sandra Leonard will debut "Wandering Bird" from 7:30-10:30 p.m. Saturday at the center, 2407 W. 111th St. Tickets cost $25 each or $15 for students. Leonard, a Beverly resident, has been creating sculptural clothing and wild costumes for more than 25 years. For her latest show, she has partnered with longtime friend and choreographer, Sandra Kaufmann. Kaufmann is the founding director of the dance program at Loyola University. She and Leonard met years earlier as students at Northern Illinois University. In fact, Kaufmann modeled one of Leonard's first hats for a props class. The pair aim to showcase Leonard's wild wares through a series of on-stage movements and dance. Also brought on to help with this effort is John Colson — Leonard's husband who designed the whimsical sets. "I see my costumes as being part of this fantasy," said Leonard, who also works as a real estate agent and has a studio in nearby Blue Island. Leonard will bring 15 of her surreal costumes to the stage of the arts center for a roughly 45-minute show. One of her costumes is made entirely of wood. Others feature wide hoop-like skirts. And still others are without slots for arms. All of this unrestrained clothing is meant to pull viewers out of reality and into Leonard's fantasy world. To further do so, she has incorporated dreamy music from Dead Can Dance, Huaska and Jun Miyake. Kaufmann is tasked with pairing the costumes and music with the personalities of the four professional dancers and seven models that will be inside Leonard's creations. She also intends to highlight the finer points of Leonard's costumes, which each take roughly two weeks to make. "I feel like this is kismet," Kaufmann said Tuesday. "And I don't want to put the cart before the horse here, but I also think this is just the start of something more." Indeed, Kaufmann and Leonard have been meaning to collaborate for sometime. They recently learned both of their sons attend Jones College Prep and took the coincidental pairing as a sign to team up. Besides being a choreographer, Kaufmann will also be a performer. In fact, she is the "Wandering Bird." Kaufmann will wear a costume Leonard has designed to look like a vulture and will wander from scene to scene before taking the stage for the show's final performance. It is "an incredibly refreshing production," said Kaufmann, who lives in the Loop and worked for 12 years with the Martha Graham Dance Co. The New York-based dance group is credited as a pioneer of modern American dance. "It's this total vision that is so dynamic and unusual," Kaufman said of Leonard's show. Leonard considers the show to be somewhat of a sequel to "Crossing into Dream," a surrealist fashion show, performance and party that she hosted Oct. 10, 2014, at the Beverly Arts Center. Many neighborhood residents were introduced to Leonard's wearable artwork at that show, which was part of Chicago Artist Month. Leonard had been no stranger to galleries and fashion shows worldwide prior to her local debut, but still many found themselves aghast, she said. "The best compliment I get from a viewer is when they are just surprised," said Leonard, who hand-paints many of her fabrics and uses intricate stitching to create three-dimensional materials. Leonard said she's felt compelled to create her wild wares since falling in with a performance art group as an undergraduate at the University of North Texas. And she encourages attendees to stick around for the after party featuring music from The Letter Girl. 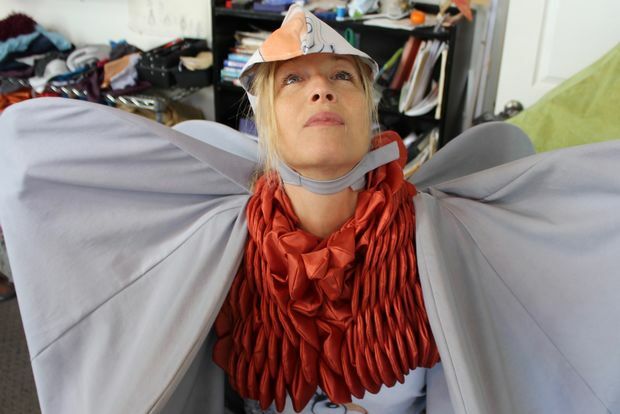 "I am creating these costumes, and I see them as wearable sculpture," she said. "I really like seeing them in movement."